MADEGOOD Chocolate Banana Organic Granola Minis - Rich dark chocolate, ripe bananas and sweet coconut. These granola minis taste just like dessert and contain the nutrients found in one full serving of vegetables. LARABAR Bites, Mint Chocolate - These delicious truffle-like bites are made from real food to satisfy your sweet craving! Made with less than 10 simple ingredients and are gluten free, non-GMO, vegan, and dairy free. KOMBUCHA WONDER DRINK Essence of Peach - Made of radiant red peach blend with organic rooibos red tea. Pasteurized Kombucha Wonder Drink includes naturally occurring acids that are known to promote health and boost vitality by cleansing, detoxifying and energizing. 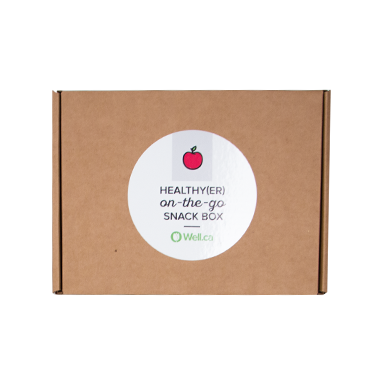 NOMZ Pistachio Energy Bites & NOMZ Coconut Energy Bites - When craving something sweet, try these energy bites. Made with minimal and simple ingredients: nuts, dates, cocoa, and coconut oil. HUNGRY BUDDHA Coconut Chips, Cheeky Chocolate - The perfect guilt-free snack to satisfy your sweet cravings! Eat them on their own, or add them to any dessert or breakfast dish for an added healthy and indulgent crunch. PRANA Carazel Organic Chocolate Bark - Made from 100% organic ingredients and is Fair Trade certified. CENTRAL ROAST Raw Unsalted Mixed Nuts - This raw, unsalted nut mix will be your trusty companion on the trail -- whether you're on a hike, on a road trip, or on a commute to work. ENERJIVE Quinoa Crackers Garlic Cayenne - Eat healthy without compromising flavour! Just a hint of rock salt on this crunchy, all natural, Cayenne-spiced cracker heats up snack time! 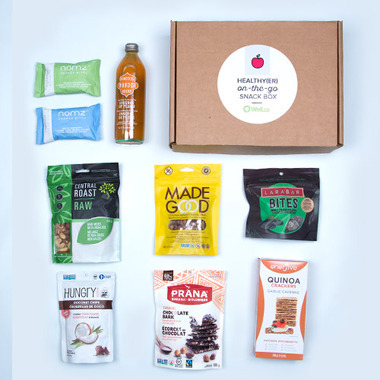 Check out our other Well.ca Boxes here! Please note that this Well.ca Box is final sale and non-refundable.